Analysis tool to perform HLA calling with HiSeq2000/2500 and MiSeq data derived from targeted HLA enrichment (view publication). Two versions of the analysis software are available. 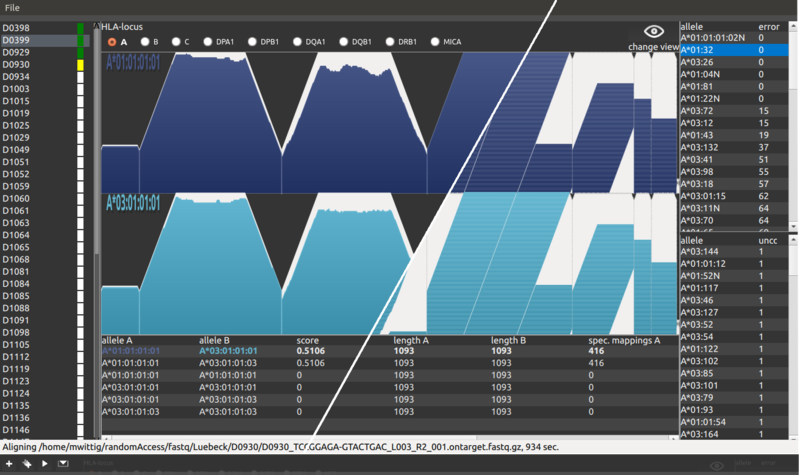 The console application, which is the first version of the HLA analysis algorithm. It is available as open source and must be compiled at the target system. It comes as it is and we do not support/update it any more. Feel free to change anything. The results of our publication (Nucl. Acids Res. (2015) doi: 10.1093/nar/gkv184 ) were calculated with this version. The second analysis software is HLAssign. Here we reimplement(ed) the algorithm and added a graphical user interface (GUI). It is available as Linux (64bit), Windows (64bit) and Mac OS X (64bit) executable. This software allows for easy data analysis and data screening. As it is still under development, please expect minor differences between the results of the GUI and the console application. The reference data set contains short read data (fastq) of all reference samples that were analyzed for the benchmark of our HLA typing method/analysis. Feel free to download all or only a couple of samples. The fastq folder contains two sub folders. The folder 100bp with all samples that were sequenced with read length 100 and the folder 98bp for those that have a read length of 98. For each sample there is a subdirectory with the sample identifier as the folder name. We are working on an improved user interface. The initial design phases are finished and implementation runs in parallel with the further development of GUI v1.